Small rotary tools, like the ones from Dremel, provide the restorer with a valuable tool for many tasks. Light grinding, sanding inside small, hard-to-reach areas, and shaping are just a few examples of what small rotary tools can do. A convenient rotary tool product is the version that hangs from above and has a shaft with a key chuck at the end. Our model was an import bought from a tool vendor and has operated well for many years. 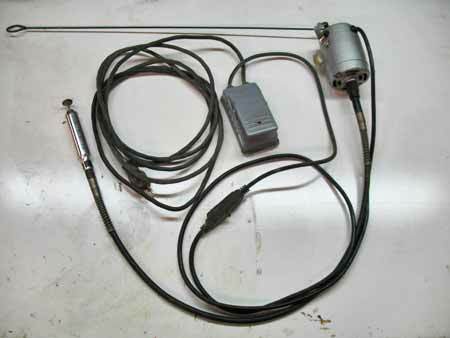 One improvement was to replace the power cord into the foot switch to a longer cord to allow moving the hanging rotary tool to where it's needed in the shop. A thick and strong rod is used to hang the motor from a location above such as a secure hook in the ceiling joists in the basement shop. Secure the rod well at both ends as the motor torques and may twist off when hitting the foot switch. 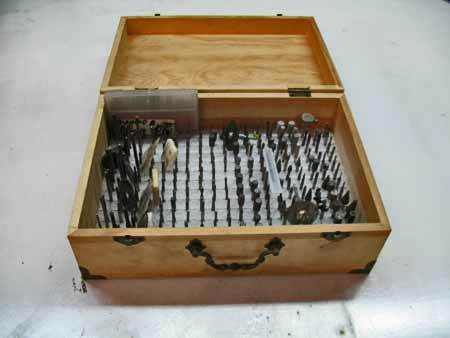 To organize our rotary tool bits, we used a sheet of dense foam fit snuggly into a medium size closeable box purchased from the craft store. Drill 1/8 inch holes into the foam and stand the bits on end so you can easily identify and handle them. Be sure to leave space for any additional bits you may want to add in the future.